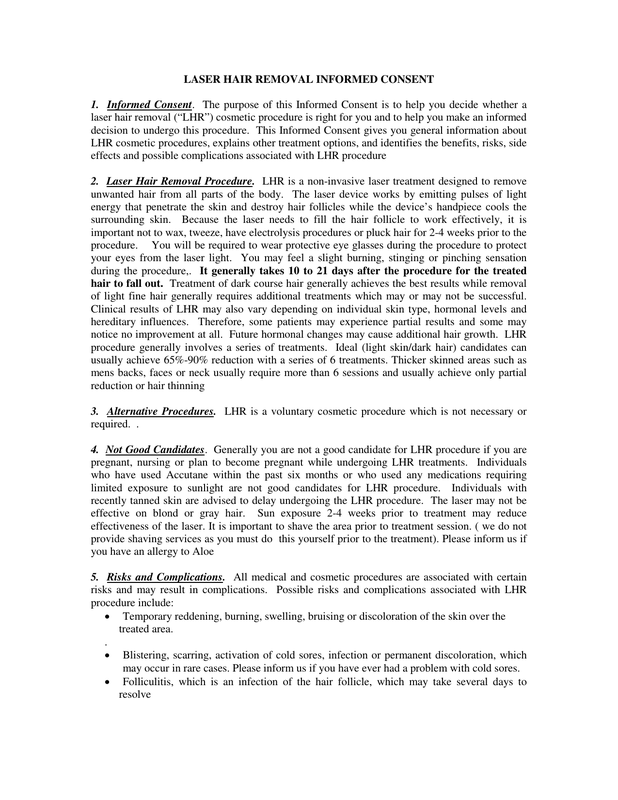 Download the Laser Hair Removal Consent Form that is designed to assist a Laser hair removal procedure. It will address how the procedure works and explains possible risks and side effects. It will also provide legally protective signatures needed for the establishment providing the procedure. Those who have alot of blonde or gray hair as the laser doesn’t always do well on these hair colors etc. It is very important that you comply with all post procedure instructions. In addition, it is also important that you limit sun exposure after the LHR procedure and use protective sunscreen lotion. You must call your doctor immediately if any complications develop post procedure. Laser-treated areas should not be exposed to sun or tanning beds. By not adhering to the post treatment skin care instructions you may increase the risk of any post procedure complications.